Sharp Electronics strives to help you create a balance between work and personal time. Our products enhance life at work, at home, and everywhere in between. Sharp is dedicated to improving lives through the use of advanced technology and a commitment to innovation, quality, value and design. 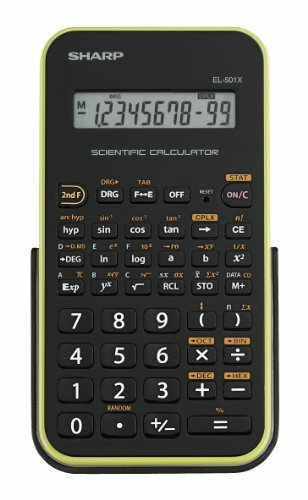 The EL501XBGR is a fully-functional, high quality scientific calculator that performs over 130 scientific and math functions. This conveniently sized calculator fits perfectly on your desk at home or at work, and it is lightweight so you can take it with you wherever you go. Also, it has a large, easy to read display and a hardcover that protects it from scratching and damage. Advanced technology and engineering gives you the pin-point accuracy you expect from Sharp Electronics. 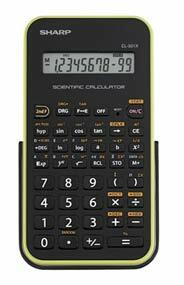 This calculator is ideal for students who are studying general math, pre-algebra, algebra, and trigonometry. Protective Hardcover - Hard cover protects from scratches.